Reductions in Government funding has meant that the money available for the NCTS was underfunded by an estimated £652m for the period of 2017/18, LGA analysis shows. This amount is significantly more than the LGA’s previous estimate of at least £200m made in 2016 and is forecast to increase further for 2019/20. To achieve this, councils have been forced to reduce spending on discretionary concessionary fares across England, from £115m in 2014/15 to £85m in 2017/18 – a fall of 26%; and in England, outside of London, spending on supported bus services is now £122m less than 2010 – a reduction of 33%. Cllr Martin Tett, the LGA’s Transport Spokesman, said: “Local authorities want to protect the bus services which provide a vital service for our communities and are a lifeline for our most vulnerable residents to go shopping, pick up medication, attend doctor appointments or socialise with friends and family. The LGA is warning that the underfunding of subsidised bus routes, coupled with councils facing an overall funding gap of £3.1bn in 2019/20, means that local authorities will struggle to maintain current subsidies for bus routes which will continue to fall unless they are given the funding to protect them. 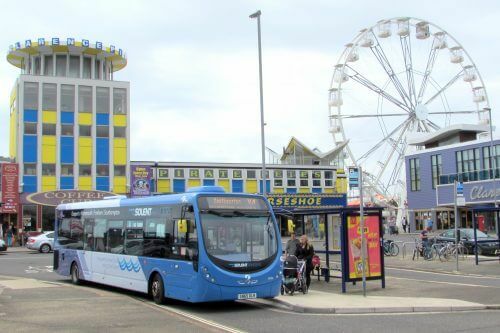 An example of upcoming service changes due to funding cuts has seen First Hampshire & Dorset announce changes from the 3 March for services in its Fareham and Gosport network. Some services will have limited operating hours, such as service 11 from Alverstoke to Fareham, which will only operate between 0900hrs and 1500hrs. Other services will see early morning, late evening, frequency and Saturday service reductions. This is an example of how operators are making major changes to their networks to ensure passengers are still able to access some level of service, rather than withdrawing it entirely. The LGA is urging Government to reinstate the full funding of the costs of the national concessionary travel scheme in its forthcoming Spending Review.